I know, I know, it's not technically Friday. Just play along, will you? Want a quick, easy, make-ahead recipe for when you have out-of-town guests for the weekend? You have GOT to try this one. Anyway, I love creating fun breakfasts when visitors arrive. You don't always know what you'll end up doing for lunch and dinner (although I always have options), but you can pretty much guarantee that everyone will be around for breakfast. I like to offer a little something sweet, a little something savory, and a little fruit. Nothing huge and heavy, but just enough to get us started. So last weekend I made these beauties that everyone loved. I made the filling a day or two ahead of time and just baked them up in the morning when I needed them. Easy! 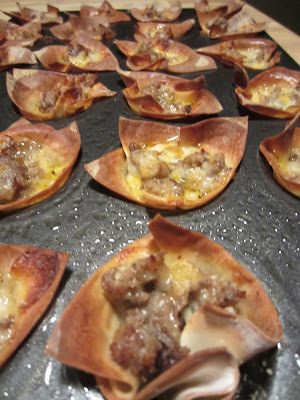 You only need four ingredients: sausage, cheese, ranch dressing, and won ton wrappers. You can handle four ingredients, right? Brown the sausage with a little olive oil. After the sausage has browned, put it in a bowl to cool just a bit. Add about a half cup of ranch dressing. And about a cup and a half of cheese--cheddar/monterrey jack combo. Let me know if you need me to slow down. At this point you can either transfer the sausage mixture into a plastic container to refrigerate until you need it . . .
. . . or you can bake these puppies up and devour them. Here's how you bake them. 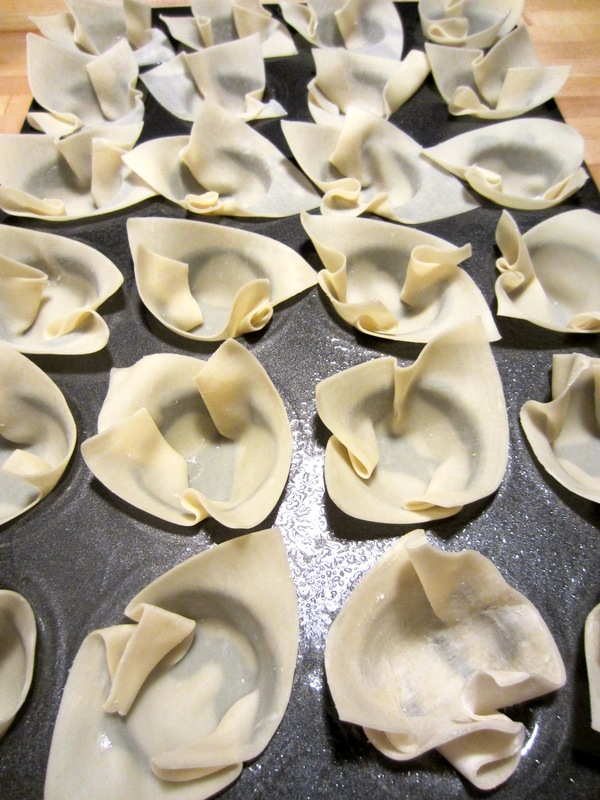 Take 24 won ton wrappers and carefully shape them into a mini-muffin tray that has been sprayed with cooking spray. Just kind of smoosh it in, like this. Put the tray of empty won tons in a 350 degree oven for about 5 minutes until they get slightly brown around the edges. Now fill the won tons with a teaspoon or two of the sausage mixture. And bake for another 10-15 minutes, but watch them! They can burn! You'll know they're done when they are crispy and brown . . . like this. Now pile them up on a pretty plate . . .
. . . and enjoy! Note: this recipe actually makes about 48 won tons. I only baked about half of what I had. If you want the printable version of this recipe, click here. It sounds fun to be a guest in your home. My kids would loooove these!